The plan would create a mixed-use entertainment complex that would include an 18,000-seat multi-use arena, retail, dining, offices and a hotel. A development team led by the New York Islanders will invest $1 billion in private funds to transform Belmont Park into a state-of-the-art sports and entertainment destination, including construction of an 18,000-seat arena that will bring the hockey club permanently back to Long Island. In one of the most significant days in the team’s 45-year history, state officials announced Wednesday that the Islanders’ proposal had been selected to redevelop the state-run park in Elmont, beating out NYCFC, a soccer team partially owned by the New York Yankees. The Islanders, which moved to Brooklyn’s Barclays Center in 2015 after playing more than 40 years at the Nassau Coliseum, hope to break ground on the year-round arena in the spring of 2018 with the building expected to open in 2020. Cuomo said the project will serve as an economic engine for the region, increasing visitor spending, stimulating local businesses and creating 12,300 construction jobs and 3,100 permanent jobs. New York Arena Partners, the Islanders’ partners in the development — which includes Sterling Project Development, a real estate firm run by the Mets’ Wilpon family, and Oak View Group, an arena development company partially funded by Madison Square Garden — will finance the entire project. The group will sign a 49-year lease with the state and pay a total of $40 million in rent. The arena is expected to host up to 150 events per year, including concerts, college sports, conferences and family events. The plan calls for 435,000 square feet of space of retail stores, restaurants and a movie theater; a hotel with 200 to 250 rooms and nearly 6 acres of outdoor recreation space, including 10,000 square feet of community space. The Belmont Long Island Rail Road station would become a full-service station with the area enhanced by landscaping, public art and a bike path connecting the property to the residential community. “The plans transforms the parking lot into a hub of economic opportunity, activity and entertainment,” said Howard Zemsky, president of Empire State Development, the state’s business agency that selected the winning bid. NYCFC proposed a 26,000-seat open-air stadium, 400,000 square feet of retail, a 5.2-acre community park and a 2-acre soccer facility. ESD did not provide financial details of NYCFC’s bid but said the Islanders’ plan would generate more economic activity. Cuomo has asked NHL Commissioner Gary Bettman to allow the Islanders to play some home games at the Nassau Coliseum — which opened in April after a $160 million renovation — while construction of Belmont is underway. The Coliseum, which seats 13,900 for hockey, is “not a viable home for the Islanders” on a permanent basis, Bettman said. But he said the NHL will “review” whether to allow the Coliseum to host some games on an interim basis. 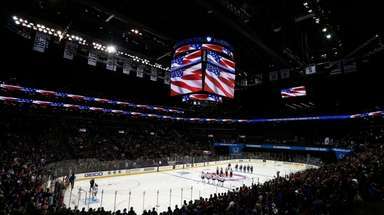 The Islanders or Barclays can opt out of their 25-year licensing agreement in January. The team is negotiating with Brooklyn Sports & Entertainment, which operates Barclays Center and the Coliseum, on amending the lease. The negotiating window closes Jan. 1, and both sides have until Jan. 30 to deliver “opt-out” notices. 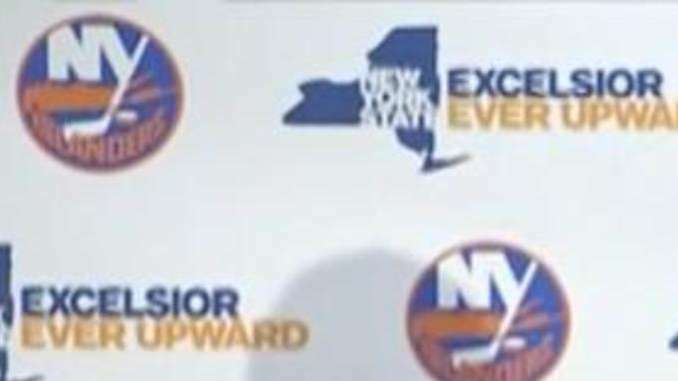 Kevin Law, a close Cuomo ally and president of the Long Island Association, the region’s largest business group, said the Islanders could begin playing some games at the Coliseum as early as the 2018-19 season. “We understand the required approvals from all parties involved to make that happen, and are prepared to facilitate any necessary enhancements,” Brooklyn Sports & Entertainment said in a statement. Belmont first opened in 1905 and was last redeveloped in 1968. The state-run land is considered among the region’s most valuable real estate, with dozens of acres of underutilized parking lots bordering the Cross Island Parkway. The New York Racing Association plans to upgrade the track, clubhouse and heating systems next summer, said NYRA President Chris Kay. The Islanders project is not without critics. Area civic groups plan to file suit to stop the project, arguing ESD failed to follow state law by not establishing a community advisory council to address community concerns. “Residents must now turn to the courts and the ballot for redress,” said Aubrey Phillips, vice president of the Parkhurst Civic Association. ESD has historically created community advisory committees after a developer has been selected and the Islanders group has said they plan to work with these local organizations. The Islanders have worked to build a new arena for more than a decade. Former team owner Charles Wang proposed a privately funded, $3.7 billion development called the Lighthouse Project that included a renovated arena, 2,300 units of housing, 1 billion square feet of office space, 500,000 square feet of retail and a luxury hotel. The GOP Hempstead Town board killed the project, arguing it was too dense for the community. In 2011, Nassau County Executive Edward Mangano proposed a public referendum to borrow up to $400 million in taxpayer money to renovate the arena. But voters rejected the proposal and the team signed a contract to move to Brooklyn the following year.